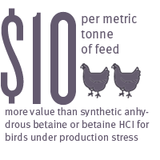 Derived from non-genetically modified sugar beet, our natural betaine increases lean meat yield and reduces costs through the reduction of choline chloride and methionine in feed formulations. It also alleviates the negative effects of osmotic stress and helps maintain gut integrity, which in turn can positively impact animal performance. A closer look at the many features, advantages and benefits of Betafin® natural betaine. Ahmed Amerah reveals research on the considerable production stress and gut health benefits offered by natural betaine versus HCL equivalents.